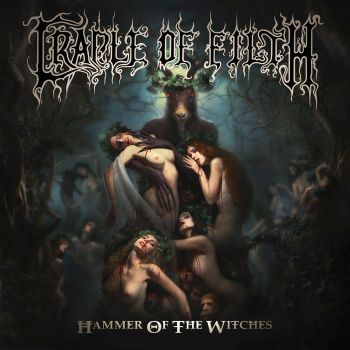 CRADLE OF FILTH - HAMMER OF THE WITCHES (CD) | Online Shop | Wizard LTD. Album: "HAMMER OF THE WITCHES (CD)"
But despite their indubitable authority and prowess, CRADLE OF FILTH have never been immune to the shifting sands of time, resulting in an almost comical reputation for line-up changes that, unusually, has had the parallel effect of imbuing the band with an omnipresent air of ongoing evolution and mutation. With that in mind, the exhilarating reaffirmation of malicious values showcased on new album »Hammer Of The Witches« stands out as a clear milestone in CRADLE&apos;s lengthy history, as the ferocious chemistry that has swiftly developed between these virtuoso miscreants – Dani Filth, newly recruited guitarists Richard Shaw and Ashok, bassist Daniel Firth, keyboard priestess Lindsay Schoolcraft and stalwart percussive powerhouse Martin Skaroupka - is laid bare across 56 minutes of extravagant, adventurous and thrillingly extreme heavy metal. Striking a sublime balance between the classic, twin-lead grandiloquence of 90s triumphs like »Dusk & Her Embrace« and »Cruelty & The Beast« and the tougher, gnarlier textures of recent masterworks like »Godspeed On The Devil&apos;s Thunder« and »Darkly Darkly Venus Aversa«, »Hammer Of The Witches« is arguably the most focused, absorbing and fearless album the band have ever produced, as fresh blood and a renewed sense of purpose collide in a shower of bloody sparks. Continuing their grand tradition of infusing each album with a unique atmosphere and conceptual elements that embolden the songs&apos; dramatic execution, »Hammer Of The Witches« is classic CRADLE from start to finish. And with typically mischievous aplomb, the album&apos;s title gleefully flips the historical script, turning the tables on the gruesome witch hunts of 16th and 17th century Europe and exacting some hard-earned vengeance on behalf of all of those who suffered persecution at the hands of religious zealots during that turbulent period in history. From the eerie orchestral overture of album intro ‘Walpurgis Eve’ and the explosive, high velocity eruption of ‘Yours Immortally’... through to the grim, dynamic shadowplay of first single ‘Right Wing Of The Garden Triptych’ and the epic bombardment of the Crusades-inspired ‘Onward Christian Soldiers’, the eleventh CRADLE OF FILTH album is both a strident reaffirmation of this band&apos;s eternal class and a reinvigorated statement of intent from a revitalised metallic force at the peak of their collective powers. The hammer is coming down, hard, and revenge will be sweet indeed.